The cabins of the A-ROSA BELLA are equipped with high-quality materials and premium design. It is designed to ensure you can enjoy the true ambience of your chosen destination, no matter the time of year. The range of culinary delights on board leaves no wish unfulfilled. You can help yourself to the lavish buffets and enjoy your meal in the restaurant or on deck, the choice is yours. A special highlight on board is also the live cooking events where you will witness the chefs create their special dishes. A-ROSA relies on a high-quality programme of entertainment. For those who wish to know their surroundings, there are talks about the landscapes/destinations and you can also take part in workshops. The events continue on in to the night where you can hit the dance floor or enjoy a glass of wine in the evening. For the sports enthusiastic guest, the A-ROSA BELLA will ensure complete entertainment. It features a pool and hot tub and offers a fitness room and a putting green. Among the many shore excursions you will also have the opportunity to participate in Nordic walking or biking tours. Guests can also relax in the on-board spa which has a glassed-in sauna. The A-ROSA BELLA hosts a casual comfortable atmosphere. Guests can dress as they feel comfortable. Be reminded, however, to bring weatherproof clothing and comfortable footwear for the excursions and warmer clothing for cozy evenings on the deck. 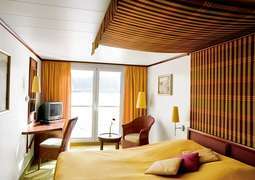 Internet on board: There is the possibility to use Wi-Fi on board the ship but check with reception.